What are tuition management services? From students applying for financial aid to parents making sense of a college bill, tuition can be a complicated process. That’s why tuition management services can be invaluable to just about any kind of business. Most literally, tuition management services can apply to college and university billing management systems for students and parents. The term especially applies to financial aid offices, since students are regularly billed for classes, dorm rooms and other fees throughout the academic year. The reams of paperwork related to college bills can make for stressful circumstances. The National Association of Student Financial Aid Administrators conducted research on financial aid letters and found that, no matter the aid letter type, each one left students and parents feeling overwhelmed and confused by the information presented. This fact, combined with a college’s need to manage potentially tens of thousands of students’ information, means that a system to organize tuition payments is a business imperative. Some schools will create their own tuition management system; others will outsource to companies like TMS, which offers services like an online payment portal and automated payment reminders. And since Internet technology is ubiquitous on college campuses, many colleges and universities are transitioning over to online-only communications. Another way to interpret tuition management services is in managing a scholarship program, from application review to award disbursement. If you’re seeking a way to enable students to attend college, creating a scholarship program can fit the bill. These programs range from individuals wanting to set up a memorial scholarship in a loved one’s name to a corporation creating a scholarship program for applicants nationwide. Because scholarships are such a valuable way for students to pay for college, they can play a large role in influencing what tuition will look like once a student receives a financial aid letter. A scholarship program goes hand-in-hand with billing management: Knowing how and when to disburse awards to a student is crucial. Consequently, while some groups manage scholarship programs in-house, many also contract out to save time and to work with experienced professionals. An organization like Scholarship America’s Scholarship Management Services is the nation’s largest administrator, working with over 1,200 corporations, individuals and foundations. 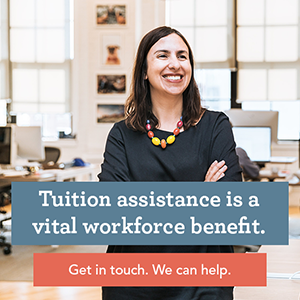 Last but not least, tuition management services can be interpreted from a human resources perspective: An employer can offer a tuition assistance program or tuition reduction program. Educational benefits can extend beyond an employee, too, to include a spouse or a dependent child. In a tuition reduction program, a benefit-eligible employee — or their spouse or dependent — could take courses at a reduced tuition. Offering such a program allows an employee to be engaged by attending classes at community college, college or university, while also learning new techniques to apply to work. Considering the diversity of “tuition management services,” clarifying its meaning to you and your audience will allow you to deliver top-notch services. And, by offering tuition management services, you’ll not only help your business, but create even more value for the individuals that will benefit from them.